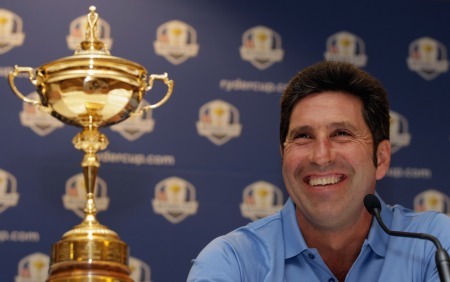 Faldo predicts Ryder Cup tie - good news for McGinley? 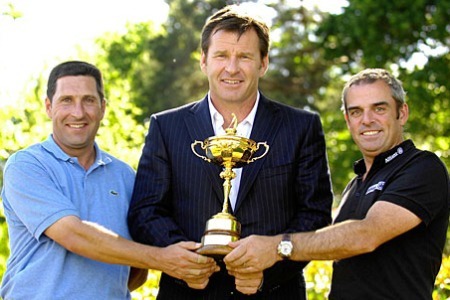 Jose Maria and Paul McGinley were set to act as Nick Faldo’s vice captains in 2008. McGinley resigned before the matches and Europe lost in Kentucky.Nick Faldo is tipping Europe and the United States of America to play out the first Ryder Cup tie for 23 years. And if that’s that they case, it could be good news for Paul McGinley’s chances of becoming the first Irishman to captain Europe in the biennial team contest. Speaking in at the Lough Erne Resort during last week’s Faldo Series Grand Final, Faldo said: “I said it earlier in the year, half joking. We haven’t had a tie or a draw for years. “When you look at the two teams on paper, in theory there is going to be a point either way, isn’t there? They are so evenly matched. If Jose Maria Olazábal’s side emerges with a tie at Medinah, the trophy will remain in Europe’s hands as defending champions. And that could leave the way clear for McGinley to don the captain’s hat in Scotland on 2014, according to a leading tour source. “If Europe lose in Chicago, the tour will be wheeling out the heavy artillery in Gleneagles,” he said. “The Ryder Cup is so important to the European Tour that they will feel obliged to pick the strongest character possible for Scotland to win it back. Or tie, as Faldo predicts. The Ryder Cup last finished as a 14-14 tie at The Belfry in 1989, when Europe retained the trophy following their win in Muirfield Village in 1987. Paul McGinley believes he has justified his decision to resign as one of Nick Faldo’s Ryder Cup vice-captains. Colin Montgomerie has predicted that Ireland’s Paul McGinley will lead Europe into the Ryder Cup at Gleneagles in 2014. European Ryder Cup captain Jose Maria Olazábal has named Darren Clarke, Paul McGinley and Thomas Bjorn as three of his four vice captains for the matches at Medinah. Picture ©Getty ImagesEuropean captain José María Olazábal has named Thomas Björn, Darren Clarke and Paul McGinley as three of his four vice captains for next month’s Ryder Cup in Chicago. McGinley on Poulter: "He's like an actor getting into character"
Vice squad. Paul McGinley and Darren Clarke with fellow vice-captains Miguel Angel Jimenez and Thomas Bjorn and captain Jose Maria Olazabal. Photo Colum Watts/www.golffile.iePaul McGinley and Darren Clarke will have to battle it out for the 2014 Ryder Cup captaincy in Scotland. But if world No 1 Rory McIlroy had his way, he’d give Clarke the job in America in 2016, indirectly backing McGinley to take over from Jose Maria Olazabal at Gleneagles in two years’ time. 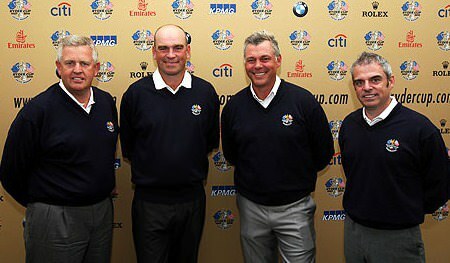 Montgomerie with potential Ryder Cup captains Thomas Bjorn, Darren Clarke and Paul McGinley. All three were assistants to the Scot at Celtic Manor in 2010.Colin Montgomerie and Darren Clarke are not always on the same page.